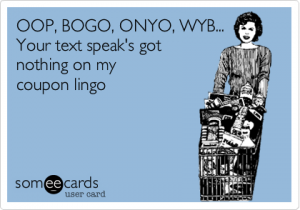 So you are looking to start using coupons, and have read all the blogs out there. Everyone tries to make things easier by using abbreviations, but sometimes that make sit hard for the FTS (First Time Saverr). We looked as far as the eye could see (at least on the internet) and found tons of great abbreviations. We compiled this list so the next time you read about great deals, you know what you are looking at. $1/1, etc. - Indicates the value of a coupon, $1 off 1 item in this instance but could be any value, $4/2 ($4 off 2 items), etc. Blinkie - Coupon dispensed from a box attached to a store shelf. The term “blinkie” comes from the box which sometimes has a blinking light. CRT - Cash register tape — often referring to coupons at the bottom of your receipt. YMMV - Your Mileage May Vary. Means all stores may not accept or participate. Any that we missed? Let us know in the comments section.